The fact is that most writers usually end up having common themes in many or all of their stories and I’m guessing that you are probably no different. Often, these kind of emerge unconsciously and they may well change over time too. 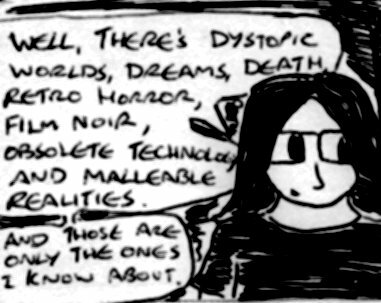 For example, some of the themes in my more recent comics, art and stories (2012-2013) are: dystopic worlds, dreams, death, retro horror, film noir, obsolete technology and malleable realities. However, in 2008-11, the main themes in my fiction and comics were: paranoia, rebellion, dystopic worlds, pre-apocalpytic horror, sanctuary, gothic things, gender, hidden knowledge, cynicism and death. In 2005-7, the main themes in my fiction were: traditionalism, Victoriana, surrealism, detectives, dystopic worlds, death and old things. In 2000-2004, most of the themes in my fiction were: splatterpunk horror, death, stylised rebellion and dystopic worlds. The themes in a writer’s work can change over time and, in fact, they should. If you’re experimenting creatively reasonably often, then your work will evolve and change. Likewise, as you read more widely, watch more TV shows etc… then you’ll probably be inspired by different things and this may lead to new themes emerging in your work. Plus, your life, opinons and worldview will probably have at least some influence what themes appear often in your work too. But, if you don’t know what themes appear in your stories, then it can be worth thinking about (or asking one of your readers) what they are. 1) It helps you to think of your work as a whole: I’ve written before about the importance of geeking out about your stories and being the number one fan of your own work. Well, what do die-hard geeky super-fans often do? They don’t just geek out about a particular story, television series, comic series or film – they usually geek out about the person who made it too. They tend to watch and/or read other things that they’ve made too. In short, they see that writer’s or director’s work as a whole rather than just focusing on one part of it. Of course, you have an advantage here – since you actually wrote all of your own work. You created it. You even know all of the ideas which didn’t make it into your stories and all of the other ways in which your stories could have turned out . Now, if you see all of your stories as being totally isolated from each other, then you really aren’t doing yourself a favour. After all, you created all of them. They’re all parts of the same imagination. Your imagination. 2) It can help with writer’s block too: If you know what the main themes are in your own work, but you don’t know what your next story or comic will be about – then you will at least know what themes your next story/comic will include. If you know what themes your next story/comic will include, then all you need to do is to work out how to fit a storyline around these themes. Ok, it isn’t a cure-all for writer’s block – but it can help. One example is the comic I’m working on at the moment (chapter four of volume one of “Stories”). Yesterday morning, I was kind of tired and I realised that I had no clue what this chapter was going to be about – so, I thought “Well, I’ve been meaning to write a ‘film noir’ style storyline and surreal comics about dreams are fun to make”. Plus, all of the stories in volume one so far have been stories about death in some way or another (I think that “Libraria” served as a second introduction to this volume of “Stories”). Anyway, once I’d realised what three themes (film noir, death and dreams) were going to be included in my story, it made it a lot easier for me to think of the rest of it. And, a few minutes later, I’d started drawing it. 3) It indirectly helps you to innovate and experiment : The fact is that, over time, every writer tends to have their own set of cliches. Now, this isn’t necessarily a bad thing in and of itself but, if it happens too much or they turn up in literally every one of your stories, then it can become slightly boring. Being aware of the themes which run through your work can make it easier for you to spot your own cliches and to come up with new ways of expressing the same ideas and/or exploring the same themes. Plus, being aware of the themes in your work will probably make you aware of how they’ve changed over the years. Change is important to any writer – if you keep re-telling the same types of stories again and again, then you’ll probably get bored after a while . So, if your stories are starting to feel tired or repetitive, then it might be worth finding another theme which interests you and writing about that instead. Because it could easily be the case that you’re either no longer interested in a particular theme or you’ve already said everything you can about it. So, what are the main themes in your stories? Ooo mine vary. I did a lot on demons, and fantasy stories, but now moved onto human interest and spies. Which is a good thing, getting away from what I used to do all the time. Writing in the same genre for quite a while can feel kind of boring/limiting after a while. I don’t know, I usually seem to alternate between sci-fi, fantasy, detective stories, comedy and horror in most of my comics and stories (or rather most of my stuff usually tends to be a blend of at least two of these genres to some extent or another).